Just like any other sector, legal professionals are also increasingly reliant on IT and technology. As a consequence, they often fall victim to a range of malicious cyber activity and data incidents. According to The National Cyber Security Centre, 60% of law firms reported an information security incident in the last year. Law practices are an attractive target for cyber attacks for one simple reason: their servers hold a large amount of incredibly sensitive client information. Therefore, it is natural that IT directors have security concerns when it comes to moving data to the cloud. However, with Tresorit's highly secure yet easy-to-use file sync and sharing service these security concerns can be minimized. Tresorit provides end-to-end encryption, therefore, nothing leaves the user's device unencrypted, and as a consequence, no one – no government, no hacker nor Tresorit's developers – can look into the content of users' files on our servers. Tresorit also offers a wide range of security and governance features to empower legal professionals to enhance the control of their data and ensure the confidentiality of their documents when sharing internally and externally. As a result, not only can law firms stay safe but they can also enjoy the benefits of the cloud: enhanced mobility, productivity and cost savings. Are you interested in these features for free? The owner and admins of a Tresorit Business Account can apply policy templates to a set of users and create different policies to each template. Policy templates include: 2-Step Verification, IP filtering, Timeout policies, Allowed Devices and Sharing policies. Admins can monitor and decide which devices are allowed to be used to access the files, and the location where users are allowed to log into the Tresorit account to safeguard business-critical documents. Tresorit's Advanced Control enables Tresorit Business admins to enhance the security of their organisation by resetting their users' lost passwords and revoking access from lost or stolen devices. With Tresorit, you can add additional authentication steps, unlink devices from your account and wipe the files of Tresorit sync'd data if a device is lost or stolen. It allows you to set up team folders and decide who can manage, add, edit or view your data. It enables you to keep track of changes by your collaborators, solve version conflicts and use unlimited file versioning to roll back to any previous version. With Tresorit's link based file sharing, you can replace insecure email attachments and other file transfer methods, and share files or folders with your clients or external partners easily and securely. You can also keep control by setting up download limits, expiration dates, and passwords for extra protection. When using file servers, not only you have to purchase the software, you also have to dedicate human resources for the regular maintenance of the servers. 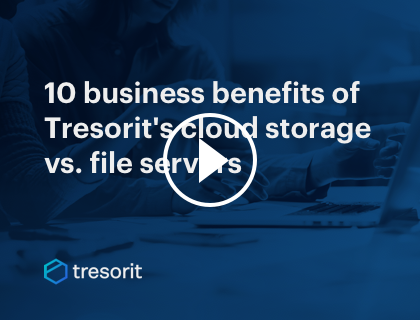 Tresorit ensures the confidentiality, integrity and availability of your files without any of these burdens and at a fraction of the total cost of an on premise file server. Tresorit Drive also allows you to save space on your devices as you can access files in the cloud from desktop file managers without downloading and syncing them. At Tresorit, a group of highly skilled developers, are working hard to take care of these tasks and to constantly provide a secure environment for your files. The data centers used by Tresorit are audited for ISO 27001:2005, SSAE 16 and several other certifications. Tresorit servers are located in highly secure, Microsoft Azure data centers in Ireland and the Netherlands. Tresorit has a certification for compliance with ISO 27001:2013 which is evidence of our commitment to information security at every level of our organization. 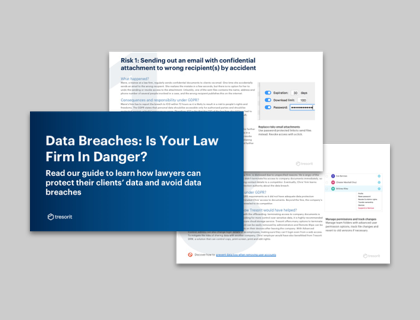 Data Breaches: Is Your Law Firm In Danger? Do you want to compare the top cloud storages?